the most excellent of all the ancient Roman poets, was born Oct. 15, U. C. 684, B. C. 70, in the consulship of Pompey and Crassus, at a village called Andes, not far from Mantua. His father was undoubtedly a man of low birth and mean circumstances; but by his industry so much recommended himself to his master, that he gave him his daughter, named Maia, in marriage, as a reward of his fidelity. Our poet, discovering early marks of a very fine genius, was sent at twelve years old to study at Cremona, where he continued till his seventeenth year. He was then removed to Milan, and from thence to Naples, then the residence of several teachers in philosophy and polite learning; and applied himself heartily to the study of the best Greek and Roman writers. But physic and mathematics were his favourite sciences, which he cultivated with much care; and to this early tincture of geometrical learning were owing probably that regularity of thought, propriety of expression, and exactness in conducting all subjects, for which he is so remarkable. He learned the Epicurean philosophy under the celebrated Syro, of whom Cicero speaks twice with the greatest encomiums both of his learning and virtue: his acquaintance with Varus, his first patron, commenced by his being fellow-student with him under this philosopher. 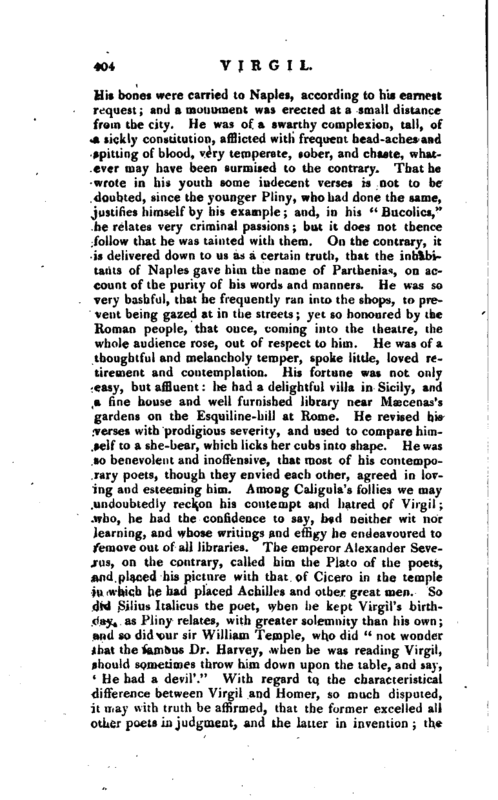 After Virgil had completed his studies at Naples, Donatus affirms, that he made a journey to Rome; and relates some marvellous circumstances concerning his being made known to Augustus, which, like many other particulars in his account of this poet, breathe very much the air of fable. The truth is, we have no certain knowledge of the time and occasion of Virgil’s going to Rome, how his connexions with the wits and men of quality began, nor how he was introduced to the court of Augustus. We cannot however imagine, that such an extraordinary gemus could lie long inactive and unexerted. 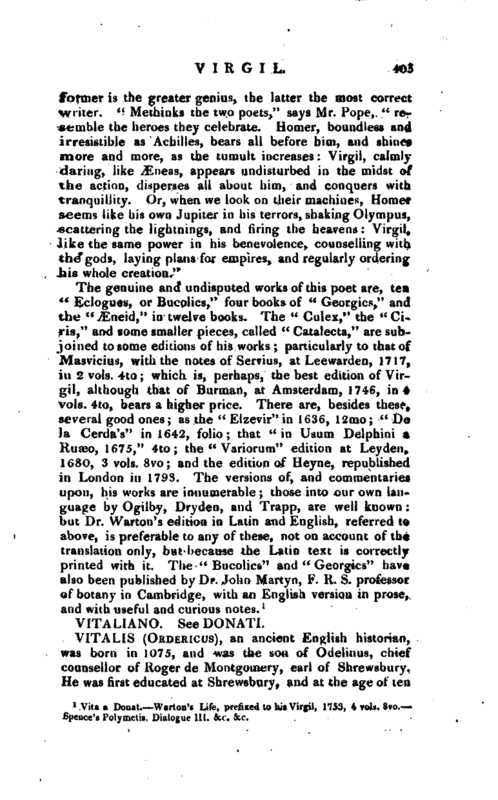 It is related that, in the warmth of early youth, he formed a noble design of writing an heroic poem, “On the wars of Rome;” | but, after some attempts, was discouraged from proceeding by the roughness and asperity of the old Roman names, which not only disgusted his delicate ear, but, as Horace expresses it, “quse versu dicere non est.” He turned himself, therefore, to pastoral; and, being captivated with the beauty and sweetness of Theocritus, was ambitious to introduce this new species of poetry among the Romans. 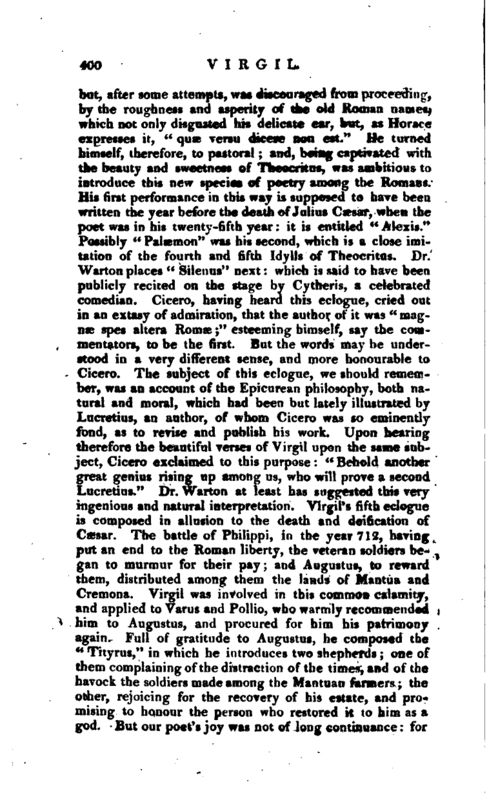 His first performance in this way is supposed to have been written the year before the death of Julius Caesar, when the poet was in his twenty-fifth year: it is entitled “Alexis.” Possibly “Palaemon” was his second, which is a close imitation of the fourth and fifth Idylls of Theocritus. Dr. Warton places “Silenus” next: which is said to have been publicly recited on the stage by Cytheris, a celebrated comedian. Cicero, having heard this eclogue, cried out in an extasy of admiration, that the author of it was “magna3 spes altera Romae;” esteeming himself, say the commentators, to be the first. But the words may be understood in a very different sense, and more honourable to Cicero. The subject of this eclogue, we should remember, was an account of the Epicurean philosophy, both natural and moral, which had been but lately illustrated by Lucretius, an author, of whom Cicero was so eminently fond, as to revise and publish his work. 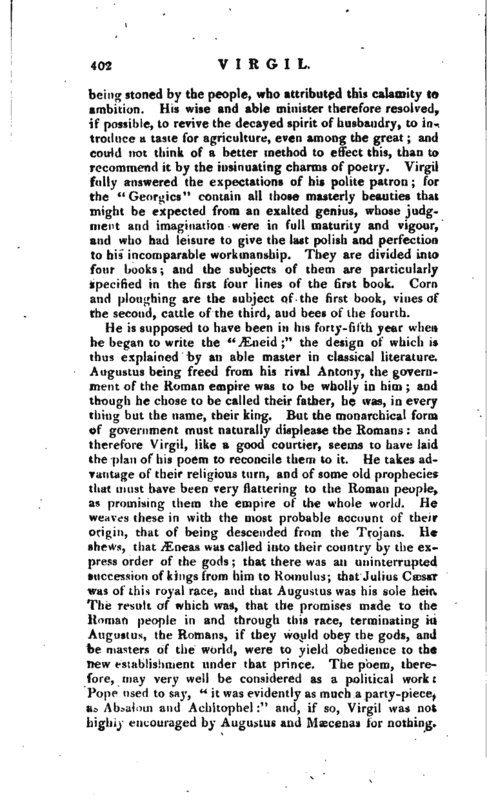 Upon hearing therefore the beautiful verses of Virgil upon the same subject, Cicero exclaimed to this purpose: “Behold another great genius rising up among us, who will prove a second Lucretius.” Dr. Warton at least has suggested this very ingenious and natural interpretation. Virgil’s fifth eclogue is composed in allusion to the death and deification of Cassar. The battle of Philippi, in the year 7 12, having put an end to the Roman liberty, the veteran soldiers began to murmur for their pay; and Augustus, to reward them, distributed among them the lands of Mantua and Cremona. Virgil was involved in this common calamity, and applied to Varus and Pollio, who warmly recommended him to Augustus, and procured for him his patrimony again. Full of gratitude to Augustus, he composed the “Tityrus,” in which he introduces two shepherds; one of them complaining of the distraction of the times, and of the h.avock the soldiers made among the Mantuan farmers; the other, rejoicing for the recovery of his estate, and promising to honour the person who restored it to him as a god. But our poet’s joy was not of long continuance: for | we are told, that, when he returned to take possession of his farm, he was violently assaulted by the intruder, and would certainly have been killed by him, if he had not escaped by swimming hastily over the Mincio. Upon this unexpected disappointment, melancholy and dejected, he returned to Rome, to renew his petition; and, during his journey, seems to have composed his ninth eclogue. The celebrated eclogue, entitled “Pollio,” was composed in the year 714, upon the following occasion. The consul Pollio on the part of Antony, and Maecenas on the part of Caesar, iiad made up the differences between them; by agreeing, that Octavia, half sister to Caesar, should be given in marriage to Antony. This agreement caused an universal joy; and Virgil, in this eclogue, testified his. Octavia was with child by her late husband Marcellus at the time of this marriage; and, as the Sibylline oracles had foretold, that a child was to be born about this time who should rule the world and establish perpetual peace, the poet ingeniously supposes the child in Octavia’s womb to be the glorious infant, under whose reign mankind was to be happy, the golden age to return from heaven, and fraud and violence to be no more. In this celebrated poem, the author with great delicacy at the same time pays his court to both the chiefs, to his patron Pollio, to Octavia, and to the unborn infant. It is dedicated to Pollio by name, who was at that time consul, and therefore we are sure of the date of this eclogue, as it is known he enjoyed that high office in the year 714. 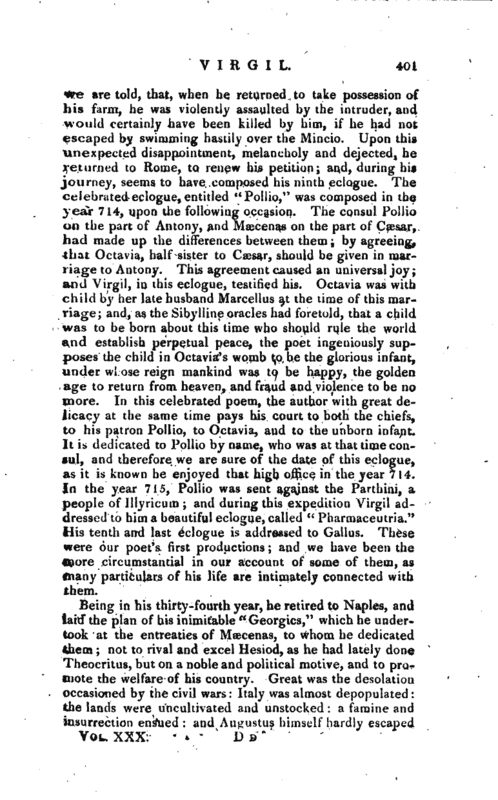 In the year 715, Pollio was sent against the Parthini, a people of Illyricum; and during this expedition Virgil addressed to him a beautiful eclogue, called “Pharmaceutria.” His tentti and last eclogue is addressed to Gallus. These were our poet’s first productions; and we have been the more circumstantial in our account of some of them, as many particulars of his life are intimately connected with them. Being in his thirty-fourth year, he retired to Naples, and laid the plan of his inimitable “Georgics,” which he undertook at the entreaties of Maecenas, to whom he dedicated them; not to rival and excel Hesiod, as he had lately done Theocritus, but on a noble and political motive, and to promote the welfare of his country. Great was the desolation occasioned by the civil wars: Italy was almost depopulated: the lands were uncultivated and unstocked: a famine and Insurrection ensued; and Augustus himself hardly escaped | being stoned by the people, who attributed this calamity to ambition. His wise and able minister therefore resolved, if possible, to revive the decayed spirit of husbandry, to introduce a taste for agriculture, even among the great; and could not think of a better method to effect this, than to recommend it by the insinuating charms of poetry. Virgil fully answered the expectations of his polite patron; for the “Genroics” contain all those masterly beauties that might be expected from an exalted genius, whose judgment and imagination were in full maturity and vigour, and who had leisure to give the last polish and perfection to his incomparable workmanship. They are divided into four books; and the subjects of them are particularly specified in the first lour lines of the first book. Corn and ploughing are the subject of the first book, vines of the second, cattle of the third, and bees of the fourth. He is supposed to have been in his forty-fifth- year when he began to write the “Æneid;” the design of which is thus explained by an able master in classical literature. Augustus being freed from his rival Antony, the government of the Roman empire was to be wholly in him; and though he* chose to be called their father, he was, in every thing but the name, their king. But the monarchical form of government must naturally displease the Romans: and therefore Virgil, like a good courtier, seems to have laid the plan of his poem to reconcile them to it. He takes advantage of their religious turn, and of some old prophecies that must have been very flattering to the Roman people, as promising them the empire of the whole world. He weaves these in with the most probable account of their origin, that of being descended from the Trojans. He shews, that ^neas was called into their country by the express order of the gods; that there was an uninterrupted succession of kings from him to Romulus; that Julius Ca;sar was of this royal race, and that Augustus was his sole heir. The result of which was, that the promises made to the Roman people in and through this race, terminating in Augustus, the Romans, if they would obey the gods, and be masters of the world, were to yield obedience to the new establishment under that prince. The poem, therefore, may very well be considered as a political work: Pope used to say, “it was evidently as much a party-piece, as Absalom and Achitophel:” and, if so, Virgil was not highly encouraged by Augustus and Maecenas for nothing. | The truth is, he wrote in defence of the new usurpation of the state; and all that can be offered in his vindication, which however seems enough, is, that the Roman government could no longer be kept from falling into a single hand, and that the usurper he wrote for was as good a one as they could have. But, whatever may be said of his motives for writing it, the poem has in all ages been highly applauded. Augustus was eager to peruse it before it was finished; and entreated him by letters to communicate it. 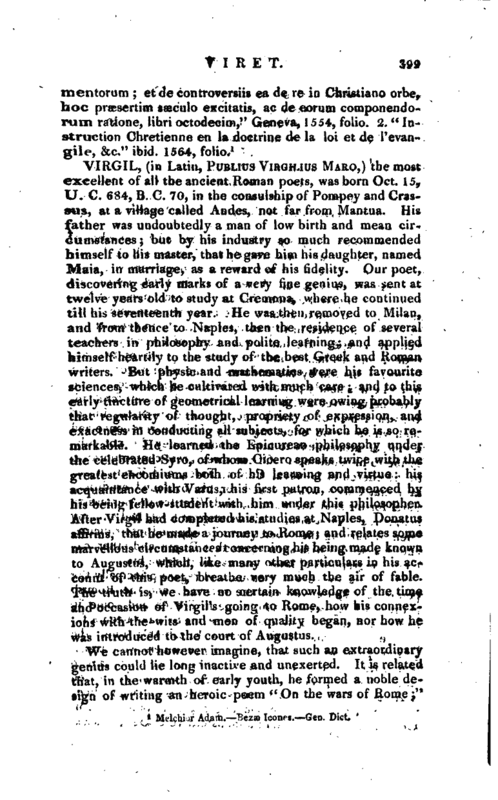 Macrobius has preserved to us part of one of Virgil’s answers to the emperor, in which the poet excuses himself; who, however, at length complied, and read himself the sixth book to the emperor, when Octavia, who had just lost her son Marcellus, the darling of Rome, and adopted son of Augustus, made one of the audience. 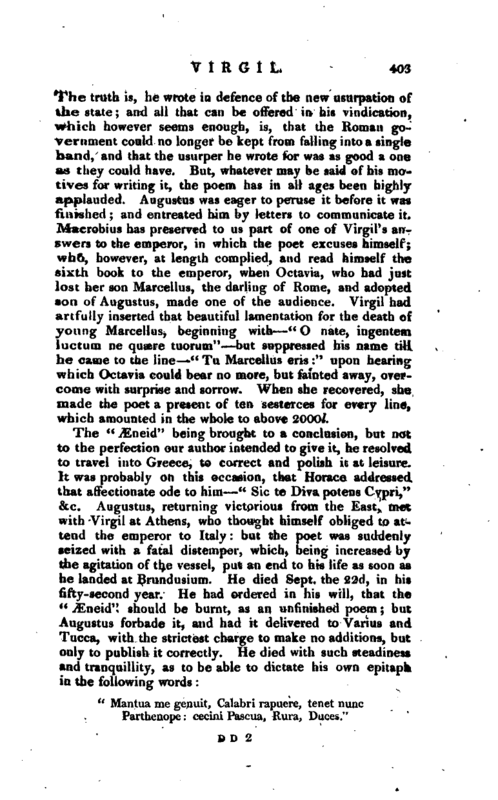 Virgil had artfully inserted that beautiful lamentation for the death of young Marcellus, beginning with “O nate, ingentem luctum ne quaere tuorum” but suppressed his name till he came to the line “Tu Marcellus eris:” upon hearing which Octavia could bear no more, but fainted away, overcome with surprise and sorrow. When she recovered, shfc made the poet a present of ten sesterces for every line, which amounted in the whole to above 2OOO/. Parthenope cecini Pascua, Kura, Duces." 1 Vita a Donat. Warton’s Life, prefixed to his Virgil, 1753, 4 vols. 8vo.-­Speuce’s Polymetis. Dialogue III. &c. &c.